And e appears from nowhere! In the original post, a quick Clojure implementation is programmed, and in Re: Factor, a Factor implementation is added. When I originally read the post, I missed that the original version was in Clojure, and decided I was good to go by writing a Common Lisp version. I'd prefer a Forth version, but as Factor is very close to Forth, it was close to cheating. Keep in mind that I wasn't aware that the first version was in Clojure! I switched to my emacs session and started slime. To my surprise, slime fired up Clojure, instead of Common Lisp! I didn't remember that a few months back I got interested in this language, and set up slime to start Clojure. Oh well. My first program in Clojure, I thought. 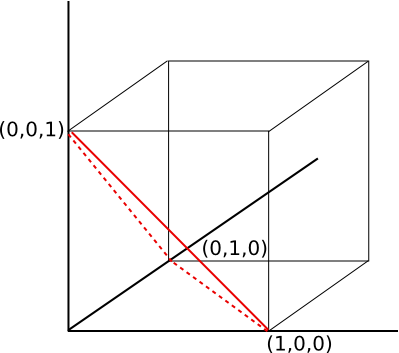 ; Initial and step start at 0.
for a gain of an 11% execution time (from 3.9 to 3.5 seconds). It looks like too little for a tail call... but as most calls end either with 2 or 3 recursions, the improvement should be small? No! It turns out that the auxiliary function call adds an overhead... which accounts for a change from 3.9 seconds to 3.7 seconds! And the real improvement from tail call optimization is just a mere 6%. Of course, if you want a quick program, you do it in C, if you want to program quick, you do in (insert your favourite quick language). The convergence of this scheme is too slow, too. But the answer comes from the mathematical proof. The first step is key. What's the probability that the sum of just two random numbers exceeds 1? The same probability as that a point (x,y) in the unit square (corners are at (0,0), (0,1), (1,0), and (1,1)), satisfied the inequality x + y >= 1. This is of course 1/2; draw the diagonal from (0,1) to (1,0), and it's the probability that (x,y) is in the upper right triangle.If you now go to three random numbers, the chance that their sum exceeds 1 is got by "cutting a slice" across the unit cube through the corners (1,0,0), (0,1,0), and (0,0,1). Observe that this pyramid (shown below) also cuts the unit square along the diagonal! This pyramid has volume 1/6, and the probability x + y + z >= 1 is then 1-1/6=5/6. A little calculus, plus the principle of induction, shows that the pyramid (standard simplex) sliced off an n-dimensional unit cube by a hyper-plane through its corners (1,0,0,0,...), (0,1,0,0,...), (0,0,1,0,...),... has volume 1/n! If you don't believe it, you can check Wikipedia for the volume of the standard simplex.